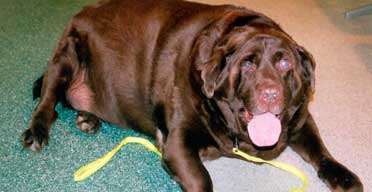 Obesity is an increasing problem; 40% of dogs in the UK are overweight. That is an estimated 2 million dogs. Surprisingly, Scotland, Wales and Northern Ireland have the largest population of obese dogs, with London having the smallest population. Find out which breeds are most prone to obesity. Discover which foods are making your dog fat. Uncover the secret to keeping your elderly dog free from flab. Learn the nutritionist's tips to reduce your dog's weight safely. It’s scary to see dogs that are overweight. The thought of rapidly decreasing their life expectancy is not a good one. This is why it’s so important to take dogs for at least 3 long walks a day to get that daily exercise. I had a Dairy Farm, my working dog was already getting heavy despite all the work. The drought ended that career, with the result, my working dog became huge due to the fact I lived alone and had to go out to work each day. This left her laying about doing nothing, her natural instincts should have seen her roaming, but she was so attached, she sat and fretted when I wasn’t there. Now I have physical problems of my own, I can’t lift her into my car to take her somewhere for a run, end result, she’s massive. What can I do? I have no one else I can call for assistance, I truly am alone with this problem. Her diet is very small, her problem is inactivity. I feel she’s too heavy to walk, her legs can hardly support her weight. She’s a pure bred Red Kelpie.